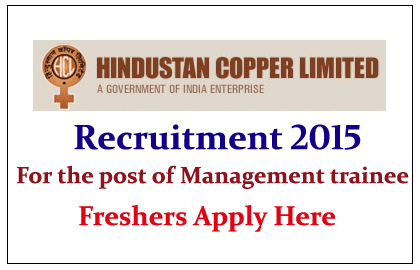 Hindustan Copper Ltd Hiring Fresher for the post of Management Trainee in different Field for the year of 2015. Location at Kolkata. Eligible candidate can apply here. Management Trainee(E-1 ->Mining,Geology,System,Finance,Civil,Mechanical,Electrical,R&D,HR,Marketing), E-1 level to E-7 level. Eligible Candidates can apply on or before 19 / 05 / 2015. Online registration starts from 20 / 04 / 2015 to 19 / 05 / 2015. Short listed candidate will call for face to face interview.